Sometimes keeping things simple is best. 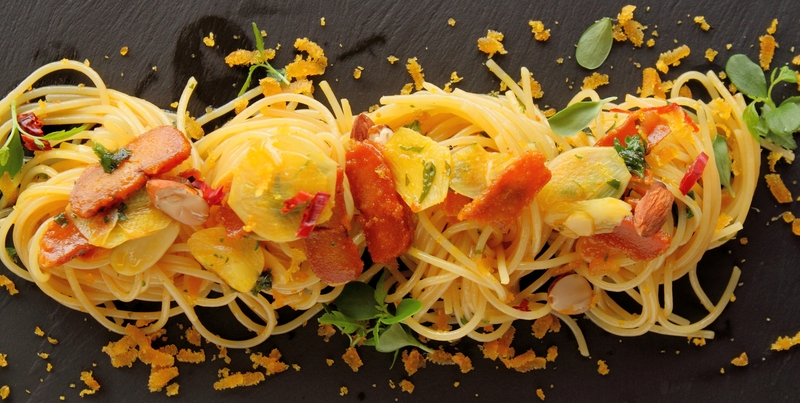 Spaghettini Alla Bottarga, this recipe combines the versatile pasta with the flavorful bottarga. This recipe was first published in Flavours magazine. Heat oil in a frying pan, add bottarga and fry till a bit crispy. Add garlic, almond flakes, chilli, and parsley, then fish stock. Season to taste. Add spaghetti and toss through. Shave extra bottarga over, if desired, and garnish with shiso leaves.